At the end of each year, analysts tend to review past performance of governments and sectors and whip forecasts and recommendations for the future. In doing so, they generally view things with a technical analytical lens where performance metrics, indicators and benchmarks come into play. Metrics matter deeply for performance with quantitative and qualitative data, information and evidence forming the bedrock of monitoring and evaluating a government’s performance. However, assessing governance effectiveness is challenging from an empirical standpoint and often information has its limitations in conveying the real impact of poor governance at the granular level—a level, which can indicate the quantum of human suffering as a result of poor governance. It is with a view to outlining this granularity that I have chosen to narrate the story of a family this year rather than get into an assessment of governance through the standard governance empirics approach. The family lives not very far from a cosmopolitan city and comprises 13 members who subsist on a monthly income of less than 5000 a month. There are many women of child-bearing age in the family, but none of them has been to an antenatal clinic or has had the privilege of birthing in the presence of a skilled birth attendant, because the government health facility close to their village is perpetually shut. Its earmarked budgets are probably being systematically siphoned off. The situation is similar for public schools; they remain closed and run ghost operations. As a result, children are out of school because their parents cannot afford private school fees. Outside their home, sewage and broken water pipes remain untended because local government officials have created systematic channels of pilfering resources from the system. The children suffer repeatedly from vaccine preventable diseases because of gaps in the immunization program, despite it being relatively well-funded for decades. The grandmother in the house has lost a limb in a suicide attack. But every time she goes to the local social protection agency to claim a constitutionally mandated allowance, her files are either lost in piles of paper, or she confronts an entrenched system of rent-seeking that excludes the true deserving. The breadwinner of the house has been swindled by a local agent who lured him into believing that he will be sent to UAE for work. As a result of this fraud, the family is deeply indebted, which is perpetuating poverty even further. A nephew has been killed as a result of gang and mafia activity, which often operate with the connivance of local political officials. One of the girls in the family was molested in a house where she worked as a domestic servant. Unfortunately, the police will not file a case, because they are in cahoots with local officials. One uncle in the family is behind bars, for alleged petty theft, but the family hasn’t seen him in months because they feel constrained to pay the ‘entry-level bribe’, which is the norm. The other uncle in the family was a clerk in a telecommunications agency. But when the country privatized the agency, they did not cater to the rights of pensioners, which left him and many others in the lurch. Finally, and needless to say, the impoverished family often has to endure up to 10 hours of load shedding in a context where public officials responsible for energy security cannot be held accountable for what they were unable to deliver. This story, which provides a snapshot of how corruption touches the life of poor individuals reeks of the sufferings of millions in the country. Behind the suffering are creative mechanisms, which extract illicit rents at every level and where well-established shadow “rules”, govern the de facto functioning of departments, ensuring systematic distribution of rents to respective hierarchies. The onus of responsibility is not just on successive governments that have ruled but also on private entities and individuals who fuel and further these practices. All the problems highlighted in the story can be translated into governance jargon—ghost schools, ghost health facilities, informal payments, institutionalized rent-seeking, regulatory failures, theft and pilferage, embezzlement, illegal fees, bribery. Each one of them is a ‘manifestation’. Just as unexplained rains and flash floods herald climate change and fever indicates disease, corruption denotes deep-seated systemic failures of governance. At the core of it, is a triad: weak governance, thriving black markets, and a legacy of patronage. When these attributes get systemically institutionalized within systems, systemic manipulation becomes a norm, misuse of authority becomes entrenched and vested interest groups flourish. When they get deeply ingrained, political links are furthered by patronage and, over time, institutional erosion sets in; the rich-poor divide is augmented, governance becomes exploitable and reforms are held hostage. Human security and national security are both compromised, as a result. These attributes of the ‘state’ system do massive injustice to the Pakistani ‘society’. The state and society are not synonymous—the former is a subset of the latter. Pakistan is a country of great potential. Its people are hard-working, entrepreneurial and resilient; the society at large is massively giving and supportive. The country has several untapped strengths inherent to its body politic. Several governance-level reforms are needed to unlock this potential, but a singular prerequisite is transparency and accountability of decision making in public sector performance. The year 2013 ended with Pakistan improving its ranking by 12 places in Transparency International’s Corruption Perceptions Index 2013 compared to last year. 2014 should build further on this stepping stone. Rather than punitive action, which does not provide a sustainable solution, the key is to focus on building institutions and systems that limit opportunities for collusion, graft, and arbitrage in the first place. Corruption is not just a cost; it is a curse, which deeply affects individuals as well as the state system. It is the single most important obstacle to economic growth and development. It is devastating for investment and growth on the one hand, and denies the poor of equal opportunity and basic services, on the other. We seriously underestimate the costs of corruption. The story of the family is one aspect of the suffering it unleashes. But more than the plundering, pilfering, and mis-targeting of resources, corruption and collusion also weaken the social fabric, undermine the safety of our population, and risk national sovereignty, threatening peace and security. As an indicator, control of corruption is highly correlated with improvements in development outcomes. Unfortunately, as opposed to this evidence, corruption control has not been high enough on the political agendas of successive governments. Conversely, one of the most critical mistakes most governments made in tackling corruption is to go straight for punitive action, which does not provide a sustainable solution. The key is to focus on building institutions and systems that limit opportunities for collusion, graft, and arbitrage in the first place. Viewing the problem through the narrow lens of financial corruption is the second mistake. Ethical and procedural collusion can be equally damaging. Corruption can either be an economic response to low incentives in the public system or a manifestation of state capture, which is the result of vested interests of the elite. The central thread to addressing both is the creation of systems of accountability and oversight, which need to be at the heart of anti-corruption reform. Comprehensive anti-corruption reform necessitates a long list of structural and institutional governance changes. A fresh consensus is needed on the national anti-corruption strategy. A long list of anti-corruption agencies involved in public redress, oversight and investigative work need to be depoliticized and strengthened—National Accountability Bureau, FIA, Ombudsman’s office—with attention to several laws and norms. Integrity is the bedrock of good governance, but structural ways of ingraining that through systems of compensation, hiring, promotions are an imperative. More broadly, integrity and transparency-promoting measures need to be institutionalized within the state system dealing with policy-making, regulation, and oversight. But measures such as these are time-consuming and need sustained incremental action across the tenure of successive governments. Even with committed action, corruption cannot be rooted out in a big sweep. The initial strategic entry points, therefore, assume importance in this respect. Four points are being outlined in this regard, which have the potential to bring about broad-based impact towards transparency. These steps are not resource-intensive; on the contrary, they are practical measures that can be taken today. The first step is attention to conflict of interest, which is a situation “that has the potential to undermine the impartiality of a person because of the possibility of a clash between the person’s self-interest and professional interest or public interest.” In the affairs of the state, conflict of interest matters deeply and is one of the key ethical questions in governance. Ministries and their related departments are institutions where safeguards against conflict of interest and the need for transparency and accountability of decisions matter the most. However, as opposed to this, rules regulating conflict of interest are not explicitly defined in the government of Pakistan norms. The Code of Conduct for Ministers alludes to the need for separation, but exact modalities are not defined in a binding instrument. As a result, policymakers could have business relationships in sectors where they are charged with policy-making responsibilities, raising conflict of interest concerns. These need to be actively regulated and managed. A concrete set of binding principles and better framing and implementation of conflict-of-interest norms is needed so that the space for policymakers to have business relationships can be narrowed, and public officials have explicit clarity on how personal interests need to be subservient to public interest. Secondly, the use of existing transparency-enhancing instruments of governance should be promoted. The word ‘use’ and not ‘develop’ has been consciously chosen here, as successive governments have invested, overtime, in a number of instruments and systems which can be governance-enhancing, but which remain underused. For example, the government’s e-office suite, which is a customized application for management of the government’s current filing system, has existed for several years. It has met all the scrutiny criteria, including audit, and was previously used by many ministries and attached departments. Not only can this system make the government’s process of moving files more efficient and tamper-proof relative to the current system being used, it can also help to gauge workers’ performance and help institutionalize accountability by virtue of its time stamping features. One of the most straightforward measures the government can take is to mandate its deployment in all government ministries and departments. There are several critically significant databases and systems that can be tapped to improve governance. The Pakistan Bureau of Statistics is digitizing census blocks and is conducting a digital mapping of ‘Points of Interests.’ Capability also exists to link this with a decision support system. Linking information to accountability systems and decision-making, if appropriately tapped, could be transformational for governance and public service delivery enhancement. This important evidence engine should be optimally tapped. Systems also exist for electronic public expenditure tracking and procurement, as well as inventory and wage management, which can help ingrain transparency. Effective use and triangulation of information from various existing data systems can enhance transparency in the use of public resources. For example, data at revenue-collecting organizations, when triangulated with NADRA data and other government information repositories, can help identify tax evaders. Effective use of existing instruments of governance alone can yield enormous benefit. Similarly, better oversight of discretionary powers, when using existing accountability and audit tools in the government of Pakistan system, can improve responsible behaviour in public office and can help conform decisions better with evidence-based rationale. The lack of progress towards these system building attributes is a lost opportunity. Finally, the combination of better access of watchdogs to decisions and proceedings in the state system under the Freedom of Information Act, along with the formulation and implementation of a whistle-blower policy which mandates government of Pakistan functionaries to report suspected integrity violations as a matter of professional obligation and personal responsibility, could have far reaching impact. These four practical policy decisions can be adopted today, without any need for significant resource allocations. Though not sufficient, these are necessary initial steps without which there could be little progress in the overall scheme of anticorruption reform. The government should consider adopting these to signal their commitment to anticorruption reform. 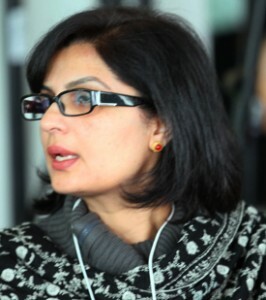 Sania Nishtar is the founder and president of Heartfile. I am really glad that someone took the initiative to talk about such a serious matter on a public forum. This is something we all know happens but we choose to stay quiet. It is time we realize our problems and work towards mitigating them! I think what is needed now really is a robust system of monitoring and accountability of funds. But who will derive it?